Researchers at Washington State University in Pullman seek participants for two research projects on “smart environment” technology to help people with memory and other cognitive problems as they age. • “Smart apartment” study: Participants 50 and older travel to an apartment, outfitted with sensors, to receive instructions and undergo observation for several hours. Volunteers go through cognitive, motor and sensory testing before traveling to Pullman. Those from Spokane receive $50 travel stipend. • In-home study: Researchers collect data from sensors installed in volunteers’ homes. Participants should be 75 or older and live alone, without pets. They’re asked to stay in the study for several years; go through twice-yearly testing; fill out some questionnaires; and, monthly, answer questions about their health on the phone. Researchers are especially interested in people who might be at risk for developing cognitive difficulties that would require them to move to assisted living facilities. “What we really want to do is better capture that history of change from normal to functional impairment, so that we find better ways to intervene,” Schmitter-Edgecombe said. • To volunteer: Both studies will continue through the end of 2014. Call Kaci Johnson at (509) 335-4033, ext. 1. Johnnie Bosworth’s memory is eroding for two reasons, she said: aging and Parkinson’s disease, which often leads to some cognitive impairment. Her stint as a research subject at WSU’s “smart apartment” in Pullman was humbling, she said. She’d forget the instructions given by researchers – to prepare for a short trip, for example – or leave steps out, or find herself baffled by some aspect. A bus schedule seemed indecipherable. But by volunteering, Bosworth, a Spokane resident, hoped to help the researchers help people like her – suffering from declining memory or other cognitive impairment as they age – live safely in their own homes. WSU researchers are seeking more Eastern Washington residents to participate in two studies on aging and cognitive impairment. The ultimate goal is to develop technology that can help older adults stay in their own homes for longer. “What we really want to do with the work is to keep people independent in their homes, functioning as independently as possible for as long as possible,” said Maureen Schmitter-Edgecombe, a clinical neuropsychologist who’s leading the research with Diane Cook, of WSU’s School of Electrical Engineering and Computer Science. The researchers are working amid changing demographics. Nearly 1 in 5 U.S. residents will be 65 and older in 2030, according to the U.S. Census Bureau. “There’s some concern about how we’re going to handle this aging population,” especially with the increased rates of Alzheimer’s and other dementia disorders more likely to appear in old age, Schmitter-Edgecombe said. 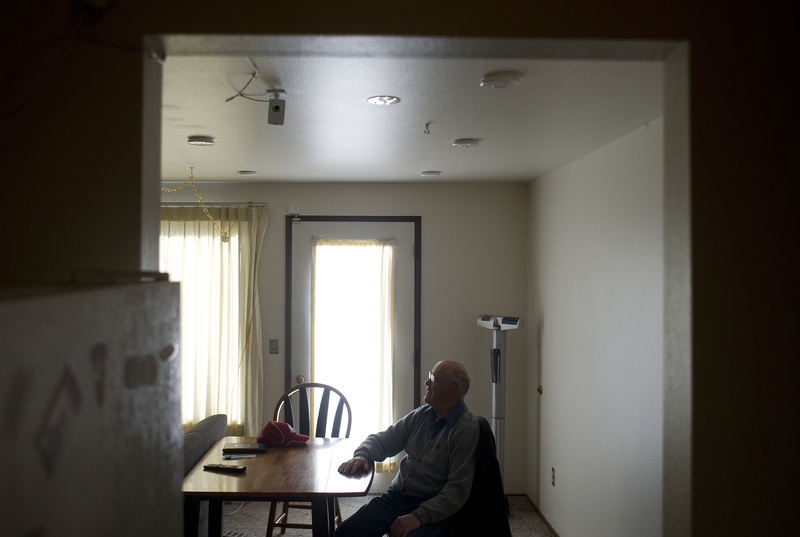 The WSU researchers are trying to figure out how to use information gathered by simple sensors installed in homes to identify potential health problems – and, ultimately, assist people suffering from memory loss or other cognitive problems as they accomplish the daily tasks of living. The research takes place both in the smart apartment outfitted with sensors at WSU and in the homes of volunteers. Researchers have found it takes just one or two sensors per room to gather the information they need, Schmitter-Edgecombe said. Most data gathered comes from motion sensors placed on ceilings or walls that tell researchers where the person is in the home. Some sensors can tell, for example, whether a door is open or whether a particular item has been removed from a spot. Researchers found they could make sense of the information – recognizing patterns in which sensors go off at what time of day and which day of the week and connecting those patterns with everyday activities, such as cooking, bathing or watching TV. Ultimately, they want to create algorithms that can “make decisions” about whether changes in those patterns indicate a potential health problem. Maybe an elderly man who veers from his normal routine – getting out of bed around his normal time, walking into his bathroom first thing and brushing his teeth – needs someone to check on him. The goal is “to be able to develop those algorithms that would pick up when an alert needs to be put in place,” Schmitter-Edgecombe said. They’re also interested in using the sensors to gather information about residents’ health, Schmitter-Edgecombe said, such as how well they’re sleeping or how much physical activity they’re getting at home. The researchers also are trying to develop technology to help people more directly, such as through verbal or other prompts that can keep people on track as they perform routine tasks – maybe reminding them to turn off the stove after cooking. Participants go through several hours of cognitive, motor and sensory testing before spending time in the WSU smart apartment or their homes are outfitted with sensors. The researchers provide feedback on their performance – “a nice free service” that provides a baseline against which to compare potential cognitive problems later, Schmitter-Edgecombe said. Jim Hudak, 81, a retired civil engineer for the city of Pullman, said he volunteered to be a research subject partly to see how his memory and cognitive abilities compared with those of other people his age. So far, so good, he said, although he’s still waiting on the report from his latest round of testing. Volunteering in the smart apartment wasn’t complicated, Hudak said. Researchers instructed him through an audio system to perform tasks, such as watering plants. At Bosworth’s house in Spokane, her husband helps keep her on track and their homeowners association helps with upkeep. She hopes to stay in their home for as long as possible. As researchers work to develop technology to help people like her live independently for longer, Bosworth is doing what she can.